While golf is often thought of as a low impact or minimal activity level sport many injuries can occur while enjoying the sport of golf. According to the US Consumer Product Safety Commission there were almost 55,000 emergency room visits for golf injuries alone in 2009. Golf injuries could include the back, shoulder, elbow, wrist, knee, ankle, foot, or other general areas. Below is a summary of some of the injuries that may occur and how to prevent them. Pilates or Yoga based activities: these exercises focus on strength of the core and flexibility of the entire body. It is important to note that core strength does not equate to having a six pack of abs. 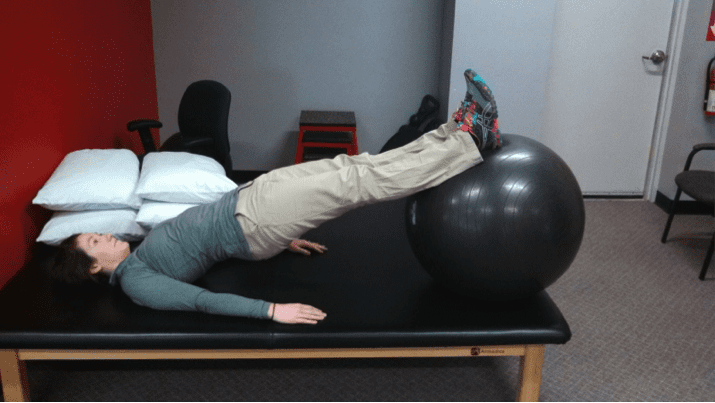 Instead core strength includes exercises that require you to maintain body positioning and awareness and maintain core stability while performing a variety of arm or leg movements. 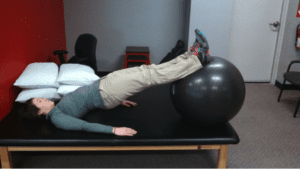 Examples include using a swiss ball to perform bridges (see below) or crunches, using theraband to mimic the back swing and follow through while focusing on maintain a tight core (see below), or a variety of medicine ball activities. Flexibility: these exercises focus on maintaining good mobility of your core and low back as well as the muscles associated with your pelvis. Exercises include lower trunk rotations, piriformis stretch, prayer stretch, hamstring stretch, and quad stretch. Doing these 5 stretches both before and after the round can help get and keep you loose and warmed up. Focus on holding for 20-30 seconds and doing 3 reps for each. Rows: Using theraband to strengthen your scapular muscles actually helps to stabilize your shoulder joint complex, especially with overhead activity. Focus on squeezing your shoulder blades together with elbows bent and elbows straight to achieve maximum benefit. 3 sets of 10 reps should be appropriate. 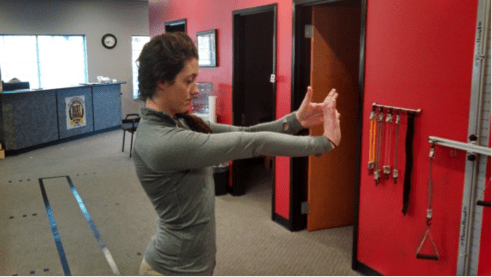 Internal and External Rotation: Using theraband keep your elbow at your side and rotate your shoulder away from the theraband’s anchor point. Focus on keeping your elbow tight to your body and rotating your shoulder to pull your hand away from your mid section (see below). Do 3 sets of 10 reps and then rotate your body 180 degrees and repeat by rotating your shoulder to pull your hand towards your mid section (see below). Stretches: With your elbow straight and your arm out in front of you apply pressure to the back of your hand in a downward direction (flex your wrist) until your feel a stretch in your forearm. Hold for 20-30 seconds and do 3 reps. Then repeat by applying pressure to the palm of your hand in an upward direction (extending your wrist so the back of your hand is facing you) until you feel a stretch in your forearm (see below). Hold for 20-30 seconds and do 3 reps. Exercises: Using theraband of small hand weights (5 pounds or less) perform motions that include wrist flexion (rotated with palm up) and extension (with palm facing away from you) with the elbow relaxed and resting on the arm of a chair. Focus on quality of movement and controlling both the contracting and relaxing parts of the motion. 3 sets of 10 reps is appropriate for this exercise. While the knee is made to twist and rotate to some degree there are several examples of professional golfers having knee issues. Most noticeably is Tiger Woods, who has struggled since having ACL issues back in 2008 that were caused by excessive rotation and force through his forward knee during his golf swing. While most amateur golfers do not have the swing speed to produce the torque Tiger does, it is still an area that must be addressed in order to prevent injury. Stretches: As with the back performing a good hamstring and quad stretch can do wonders for your knee. Please follow the guidelines in the low back section. Strengthening: It is important to focus on quads and hamstrings to help protect the knee however the hip muscles are just as important in decreasing stress through the knee. Utilize squats with a chair (also called sit to stand exercise) to help strengthen gluts and quads. The chair helps to force proper technique and ensure that the right muscle groups are being worked. 3 sets of 10 reps with a chair and you should be feeling a burn. Utilize a theraband around both of your ankles, maintain a squatted position, and side step to your right 30 times and then left 30 times in order to work on stressing the muscles around the knees and hips. Add a golf club across the front of your shoulders and work on your backswing and downswing rotations while side stepping (see below). Similar to the knee, the ankle and foot can take a lot of stress. Your front foot as you address the ball must be able to plant and absorb rotation forces as you fire your hips through impact. The trail foot as you address the ball must be able to stabilize while rotating up on your toes and you complete your follow through. Finally, lets not forget that most golf courses are not flat and contains hills, bumps to persuade or ball to go off course, and holes or dips that are covered by foliage and present potential hazards for an ankle sprain. Below are some exercises to help combat these injuries. Stretches: A good calf stretch is vital to help maintain proper foot and ankle balance and prevent nagging injuries such as plantar fasciitis. Focus on the standard runner’s stretch and hanging your heels off of a ledge or step. Hold each for 30 seconds and repeat 3 times. Strengthening: A standard 4 way ankle exercise can go a long way to keep the ankles stabilized. Using a theraband you want to position it around the ball of your foot with your knee extended and your heel propped to not contact the ground. Then you want to work around the ankle in 4 different directions (press down, pull out to the side (see below), pull your toes up, and press down and in) always working away from where the theraband is anchored. 3 sets of 10 reps for each is recommended. Balance: In order to keep your muscles and neurological pathways fast and accurate to prevent rolling your ankle you must train the muscles to react in a spilt second to protect your ankle from a sprain. This can be done by standing on one foot and performing half speed golf swings 30 times. Then repeat with your opposite foot. 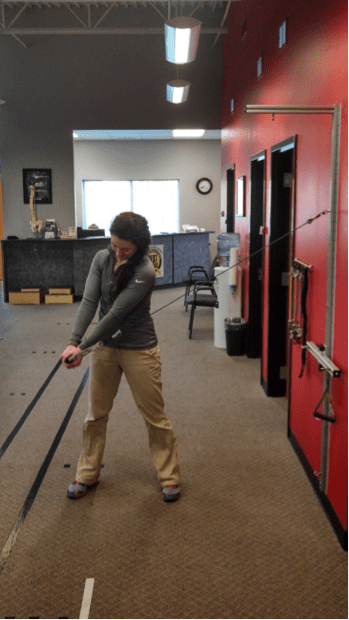 While the above information focuses on the most commonly injured areas of the body for golfers it is still important to remember some general fitness and prevention tips. First, sunscreen is a vital accessory for any golf bag. When the average golf round lasts 4-5 hours and the average warm-up session is 30-60 minutes that equates to almost 6 hours of sun exposure. Please remember to utilize sunscreen to avoid painful sunburns that can cause other health issues and hamper your golf swing. While it usually is not included with your green fee it is important to visit the driving range and practice green. Hitting 10-20 balls before a round is a great way to get your muscles warmed up. Focus on technique and tempo with your swing and save that massive swing with your driver for the course. The practice green offers a great stretch for your low back as you work on your putting stroke and pick ball after ball out of the hole. Water is your friend. Even if you don’t feel thirsty please remember to drink some water every few holes. Always be aware of your surroundings and other golfers on the course. It is important to take the time to know where your playing partners are as well as other golfers on the course to avoid injury to yourself or to others. Knowing your surroundings can avoid help you avoid stepping awkwardly into a bunker, lake, or hole. Finally, walking is always the best exercise. Walking not only promotes the game as it was intended to be played but it always is great for your overall health. Think of all the muscles you use when you walk. Also, you are getting a great aerobic exercise to help improve your endurance and stamina. Walking is a great way to convince your spouse that golf is a workout and needs to be done at least 3 times per week. The above suggestions are a great start to improving your overall health and fitness while preventing injuries on the golf course. However these suggestions are not a guarantee that injuries won’t happen. Thus, if you experience an injury while playing golf please call one of our Makovicka Physical Therapy clinics for a free consultation to aid you in your recovery. We can help you figure out what steps are needed for a full recovery. If a physician’s order is needed for formal physical therapy we will work with you to get into a physician you are comfortable with and a get a script to get you on the road to recovery. It is always easier and faster to rehab an acute injury than it is to try to treat a nagging injury that you have had for months. We can also help you with your swing or golf routine to help prevent future injuries and try to keep you golfing while you are rehabbing. Please visit www.makovickapt.com for details and locations.